Used, received on a trade in. Does your family like to get outdoors? 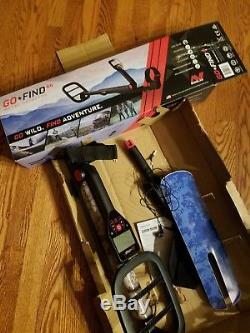 If so - then you should try the innovative GOFIND 66 metal detector. It's compact, easy-to-use and there's no assembly required. Just unfold, turn on and GO! Identify objects before you dig them, up by sorting the treasure from the trash. Use the Smartphone app to identify coins, mark you finds on Google Maps and even listen to music while you detect! 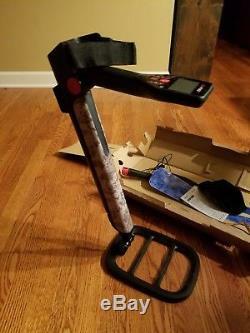 Main Features: Now includes camouflage skins to personalize your detector! Personalize your GO-FIND with easy to apply peel and press skins. Choose from two included skins to match the environment youre hunting in. The Details Advance your hunting to the next level. GO-FIND 66 is a serious, high-tech detector. It delivers precision, performance and maximum depth to unearth more treasure. Packs in a load of excitement and adventure, too. Hunt like a pro today. Portability Collapsible Body Volume 5 Volume Levels Batteries 4xAA Batteries not inc.
Waterproof Waterproof Coil Weight 2.3 lbs / 1.06 kg Length Collapsed 21.9 in / 555 mm Length Extended 51.4 in / 1305 mm Find Modes 4 Search Coverage Large (10-inch coil) Sensitivity 5 Levels Treasure View 5 LEDs Display Backlit Smartphone App Pro Version Pinpoint Technology Yes Bluetooth Yes Smartphone Holder Yes Digging Tool Yes Earbuds Yes Affordable Family Fun A serious high-tech entry level detector that's really easy for anyone to use! Compact & No Assembly Unfold, turn on and GO! Folds flat for transportation and storage. Ultra Lightweight 20% lighter than similar detectors. Go detecting for longer and find more! Treasure View LEDs Red/Green target ID. Sort the treasure from the trash before you dig it! Easy-Trak - The fully automatic ground tracking reduces noise interference quickly and easily. Google Maps® Record your treasure locations the modern way. Affordable Family Fun A serious high-tech entry level detector that's really easy for anyone to use! The GOFIND 66 is a high performance detector with many innovative features. Perfect for the beginner and also great as a back-up detector for the advanced user, a Minelab detector has never been more affordable and its great fun too! Its really easy to get started with GOFIND because there is nothing to assemble and no loose parts that can get lost when setting up to go detecting. 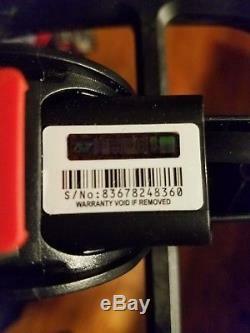 Just unfold the detector, insert batteries and turn on. The controls are pre-set and you can start detecting right away without spending half an hour or more reading an instruction manual and wasting detecting time on assembly. When youve finished detecting for the day just collapse the shafts and fold up the detector for easy transport and storage, all ready to use the next time around. The GOFIND 66 weighs only 2.3lbs (1.06kg), making it one of the lightest-weight, lowest-cost, high-performance detectors available today. It can be tiring swinging a detector from side-to-side for long periods, so GOFINDs have been specially engineered to reduce weight, and therefore fatigue, without sacrificing performance. From the smallest kids through to adults everyone will want to GO detecting again the next day! With Treasure View you can get a good idea of the type and depth of metal objects you have found before you dig them up. Its target discrimination the easy way. The red LEDs indicate iron targets such as nails, horseshoes, toy cars, keys. The green LEDs indicate non-iron targets such as coins, gold and silver jewellery, aluminium, copper and more. In Pinpoint mode the LEDs turn orange to help with determining the exact target position for easy recovery. Iron and salt minerals in the ground can cause false signals with metal detectors. 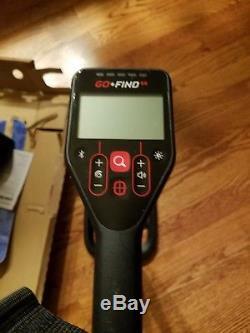 While other detectors have either a basic fixed setting, or require the user to learn advanced ground balancing techniques, The GOFIND 66 truly is switch on and go. With automatic sensing of salt ground, moving from beach to park requires no detector adjustments or special search modes. The fully automatic ground tracking minimizes ground interference and maximizes target signals, for finding more treasure. Smartphone App Control your detector, listen to music, share your finds and more With Bluetooth® functionality you can enhance your detecting experience by using your Smartphone with your GOFIND 66. The app gives the benefits of Coin ID, wireless audio, detector control, listening to music while you detect, recording find locations and sharing finds on Facebook. Go detecting the modern way and youll never look back! With 4 Find modes (All Metal, Reject Iron, Coins & Jewelry and Coins) GOFIND has plenty of target discrimination options for an entry level detector AND matches the discrimination resolution of more advanced detectors when using the Smartphone app. But rather than complicated multi-notch discrimination options and Target IDs, the GOFIND app gives you example pictures of the modern coins that you have detected a world first from Minelab and great fun for all. Wouldnt it be great to be able to record all your treasure find locations? Zoom out to see the general areas you have covered and zoom in to see exactly where that valuable coin was found. 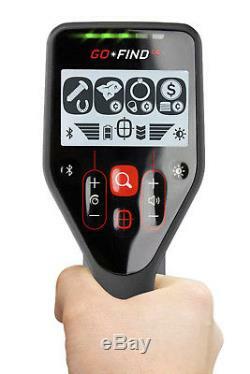 Minelab has brought some of the powerful mapping features of our flagship CTX 3030 treasure detector to our GOFIND 66. Go back to the places you have found treasure before and find even more! Extra Accessories get a FREE digging tool, ear buds, and smartphone holder. Its all there in the box to get started right away! 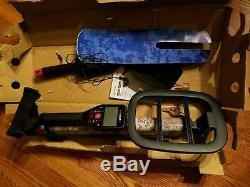 The item "Used Minelab GO-FIND 66 Metal Detector, with all Accessories and skins" is in sale since Saturday, October 6, 2018. This item is in the category "Business & Industrial\Test, Measurement & Inspection\Test Meters & Detectors\Metal Detectors". The seller is "charman-2009" and is located in Aurora, Illinois. This item can be shipped to United States.